Northcote High & Landcare – Celebrating 25th Anniversary. For some years now, students and staff from the Northcote High School Camp have teamed up with Strathbogie Landcare for an annual planting day up here on the Tableland. This year, on a cold, wet Friday morning, 29 students (Yrs 9-12) and 3 staff turned up at Smith’s Bridge in Strathbogie and proceeded to plant 250 indigenous understorey plants at several sites around the picnic area of the Bridge to Bridge Reserve – all in celebration of the 25th Anniversary of Landcare! 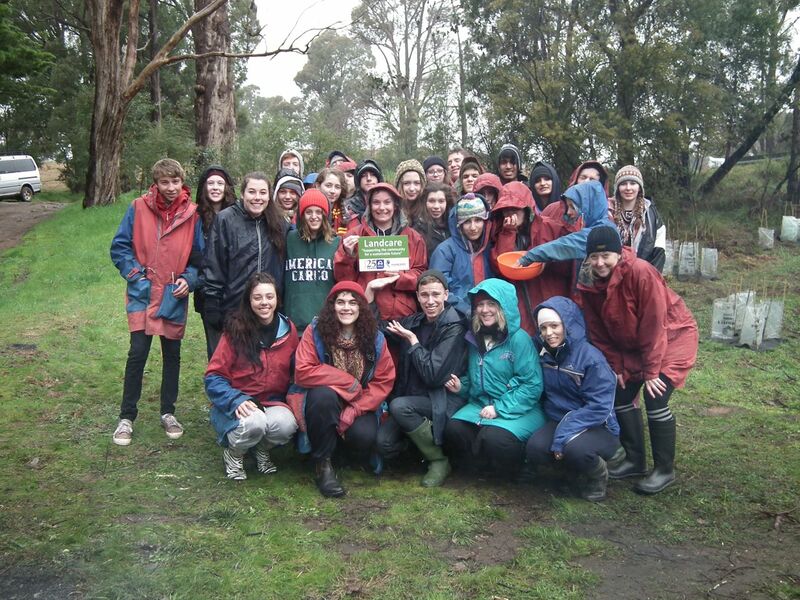 Some of these students have been coming to Strathbogie since Yr 7 and have done previous plantings with the Landcare Group, but no one could remember a colder, more miserable day. Yet, to everyone’s credit, and in spite of the rain, the work-ethic and camaraderie were fantastic! A planned walk around the circuit track was not possible due to the heavy rain and minor flooding, though the new boardwalk (under construction) will soon sort that out! But we did see a Koala! The students kept warm by the crackling fire and everyone enjoyed a hearty bbq lunch, followed by a big bowl of mixed lollies for desert – just reward for their planting & singing! in the rain. The bonfire was a big drawcard and provided plenty of opportunity to chat. Several students commented to us about the experience– “It was rewarding, a bit of fun, we used new tools, it made me feel good; it was really fun, it’s good giving back to the environment, it doesn’t seem like hard work but when you stop and look back at what we’ve done it’s really good. “ Hearing that kind-of makes it all worthwhile. Bonfires are good for the soul! Preying for the rain to stop (or the rissoles to cook more quickly).